From its humble beginnings as the multimillion dollar project of a top-tier video game studio's greatest designers, Chrono Trigger has grown to become loved and respected throughout the world. Released in 1996, the game quickly gathered adoration and soon became widely regarded as a paragon of artistic achievement and one of the greatest works ever created by man. Within eight months of the game's release, major universities began to devote entire departments to its study. The refusal to release the game in Europe until 2008 inadvertently gave rise to one of the most influential scientific discoveries of the last century, with countries that did receive copies of Chrono Trigger showing a 45% increase in life expectancy while those that did not showed crippling rates of depression and tenfold sales increases in the writings of Arthur Schopenhauer. In 2002, an influential study on rhesus monkeys showed that, given the choice between a cloth "mother" that provided food or a wire mother that provided Chrono Trigger, the monkeys overwhelmingly chose to bond with the latter. In 2003, the Royal Shakespeare Company added the Chrono Trigger stage adaptation to their lineup, and reviews universally declared it to be far superior to Macbeth. As the characters began to enter and dominate the worlds' cultural consciousness, overwhelming cults of personality formed around the game's central figures. 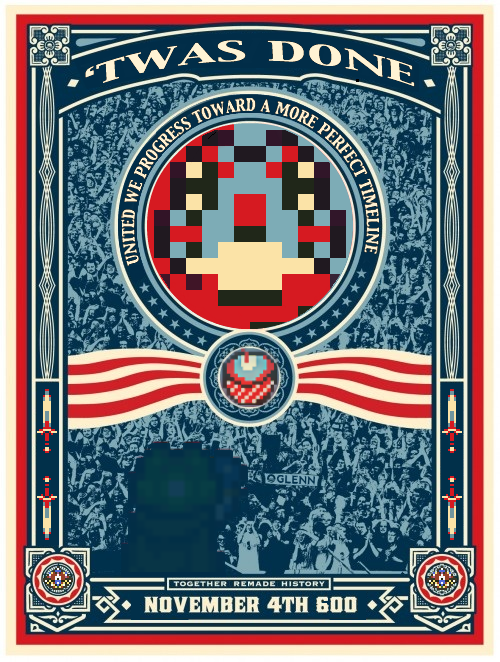 In 2001 a law was passed mandating all public parks contain monuments to the characters, and in 2008, awed by his resolute determination and anthro-lissamphibian courage, US voters overwhelmingly elected as president a schizophrenic costume-shop owner believing himself to be Frog. "Frog" would go on to eliminate the federal deficit and galvanize the world into full nuclear disarmament, though public outcry over his attempt to slice open Mt. Rushmore would leave him unable to pass either Universal Health Care or the Kyoto Protocol. Well, that's the short version. So as not to be completely misleading about what I'm doing with this LP, here are some boring logistical things. 1. 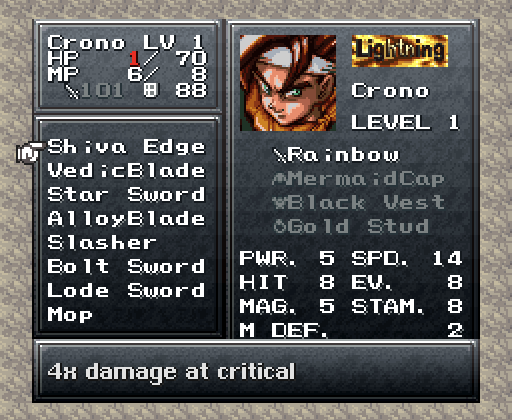 Only Crono is going to finish the game at level 1, but everyone else will be kept at as low a level as possible. This isn't going to be some sort of copout where a Level 1 Crono watches Lavos get killed by Magus at Level 50, and in fact I'm not going to be picking up Magus at all. Come the final battle, the average level of all our party members is going to be just under 12. 2. Likewise, this is not going to be a copout where I fight Lavos at the earliest possible opportunity and use some trick to make it not attack or something. I'm going to complete all of the game's sidequests, and Lavos will be fought by going through the Black Omen after using the Chrono Trigger. 3. With that said, when I say that I'll "finish the game" at Level 1, I only mean getting the default ending. I'll show off the others, but the challenge itself ends the first time Lavos bites the dust and the credits roll. There's a reason for this beyond just not wanting to play the game at a low level over and over again; it will become clear later in the LP. 4. All of this is going to be 100% legitimate, and everything I do would be completely feasible by a normal player on a normal DS, PS1, or SNES. I am not going to be recreating something like this. 5. Despite what everything else in this OP may have led you to believe, this is not fundamentally a gimmick run. I'm going to be showing off everything I would if I were doing a regular LP, and the leveling restriction is mostly an excuse to go much more in-depth on one of my favorite games than I would by breezing through. Even if this sounds like a stupid restriction or a cheap way of garnering readers and thus feeling better about my failings as a man, I'd encourage you to stick with it for at least an update or two. Also, if you've never heard of this game and have no idea what's going on, you're every bit as much the target audience for this as the people who have Marle body pillows and Schala wall scrolls. That should cover it (as well as thoroughly bore potential readers). If you haven't ever played Chrono Trigger before, I highly encourage you to track down a copy and play along, though probably with actual leveling. If you're the type of mentally deranged person like me who legitimately enjoys the high-stakes and often punishing difficulty of games like God Hand or Ikaruga, this is also a thing to try I guess. Either way, hope you enjoy it. Now, let's go kill some space hedgehogs. 18. Sorry, this is the final battle. I realize that wasn't made clear. 20. Does Jesus Get Whacked When He's Weak?